Around age 5 1/2 -6, children become very sensitive to values and highly impressionable. The work of a six year old is to develop a conscience, and she'll build one with the information she sees in her life. We have an important opportunity here to teach our child HOW to think, not WHAT to think. It's this subtle difference that results in boxed in black-and-white views, vs a creative, open-minded individual. Your child is going to be bombarded with all kind of messages, opinions, judgments, accusations, manipulation, and social pressure in her life. If she has only heard WHAT to think “because it's right, because it's the rules, because I said so, because it's wrong”, she has no skills to fall back on when her surface level morality is shattered, no filter to consider this new information with. She'll be at a severe disadvantage. Give her the tools to build her critical thinking skills and she can stand strong, carefully considering new information as it is presented. Mom: “Well, just because people have a different belief than you do doesn't make them stupid. Could they be looking at the fact that he took that long voyage to an unknown place, and mapped out the land he “discovered”? 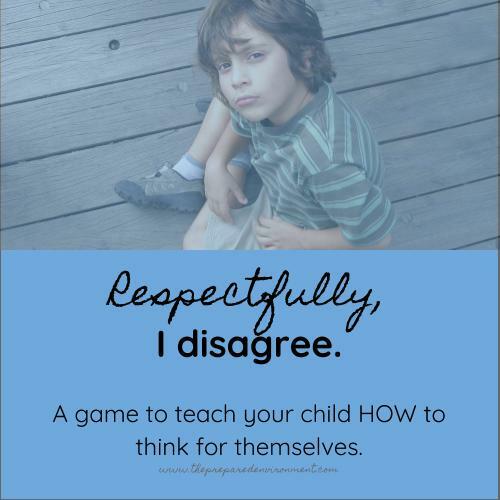 Playing devil’s advocate to challenge your child's current conclusions—whether you agree or not— models how to respectfully challenge and disagree with an opinion. Stress the difference between facts and opinions at this age. Facts are non-negotiable, and can be proven. Opinions must be respected, and good opinions have reasoning behind them (from facts). Asking questions like “Why might someone think that?” helps a 6 year old develop her sense of empathy and expand her world view. I challenge you to take on your own judgments and assumptions with curious examination as you play this game with your 6 year old. Even if you arrive at the same conclusions, you'll offer a strong model of critical thinking skills. How else are you encouraging your children to be kind, compassionate, and open-minded? Share your tips with us! Older Post5 Words to Change "I Can't" to "I'm Capable"